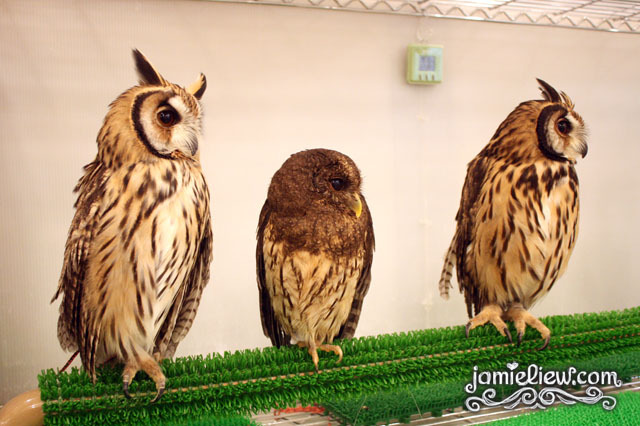 if you’re a bird person then you should have heard about how Japan’s taken over by these owl cafes. 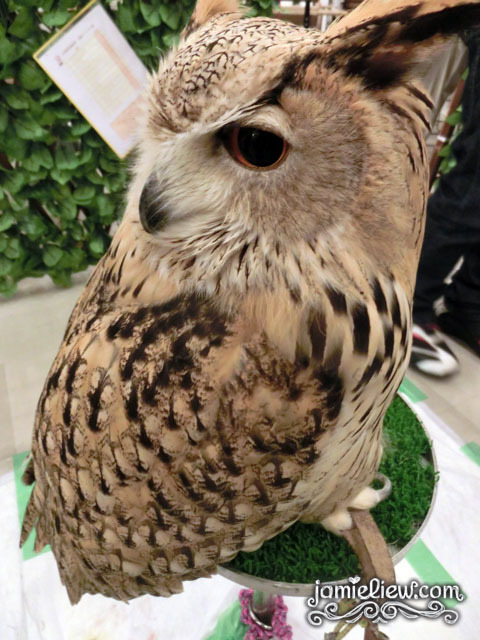 not only is owning an owl (very very expensive pet) becoming a trend, stores don’t just sell owls anymore but they are earning by letting you pet very softly on their owls and shower them with human love! 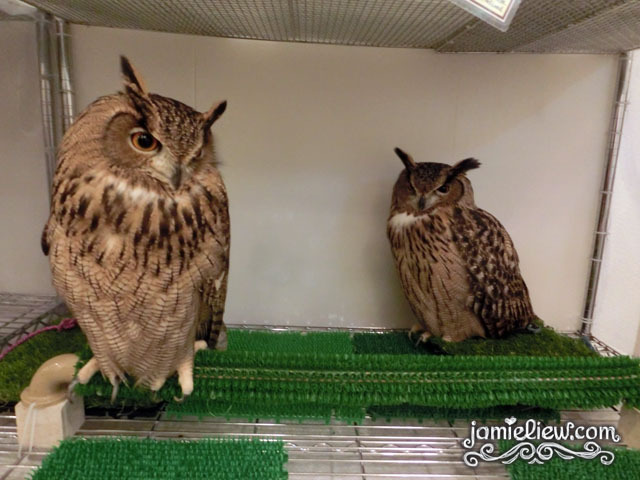 there are quite a number of these owl cafe’s but I decided to go to the one with the MOST owls! although it’s located literally at nowhere, we were practically their last customer of their day. since it was raining cats and dogs that day, it wasn’t so full. I’ve read reviews how you have to come here and put yourself on a list (they don’t accept over the phone bookings) a few hours before you actually get a place since they limit like.. 6 or 8(?) couples of 2 in only. 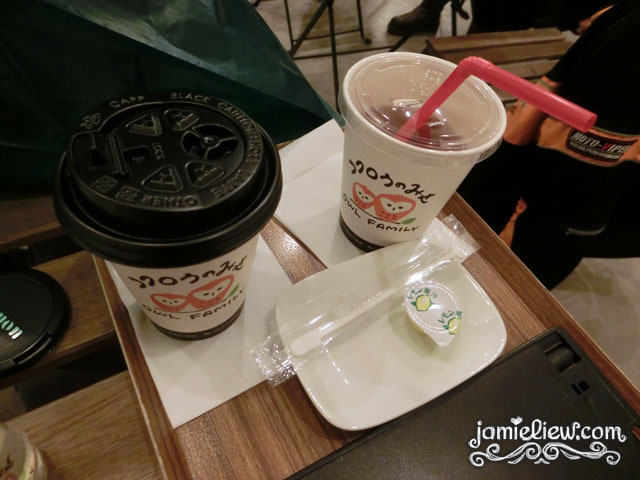 it costs 1000yen and you get a drink (which you’ll eventually just leave there) and an hour. they basically explain the rules for around 15 minutes so 45 minutes left. time goes by really quickly there! they have an ENGLISH menu so it’s quite foreigner friendly =D. so this is not even all. they are not actually tied very tightly around the pole so they can walk around the area but they are just so obedient @@. 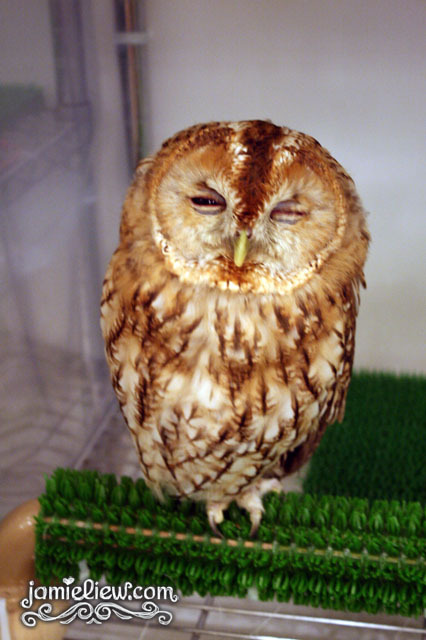 however, the ones above are actually the more badass owls so.. you should only look at them. 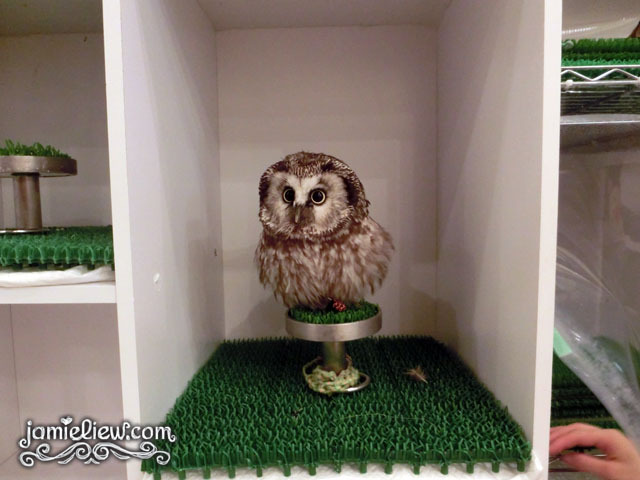 and then there’s the baby owl section. 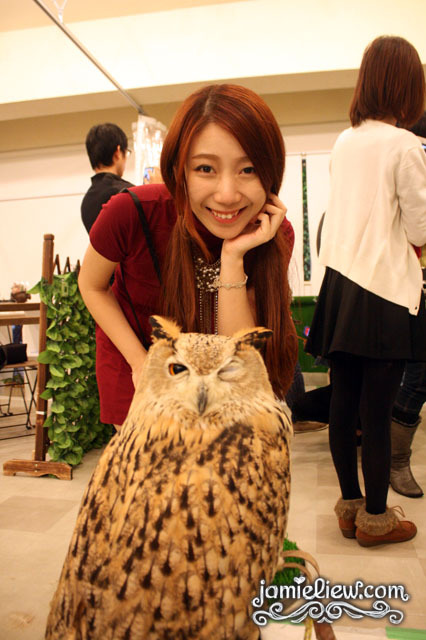 my favourite owl!!! 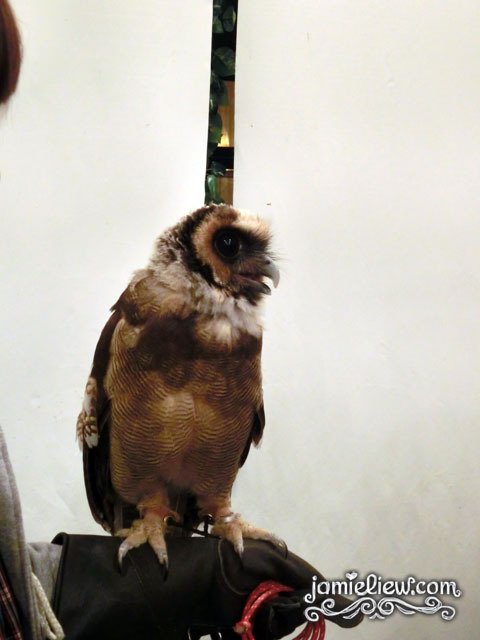 then there’s the evil looking owls. 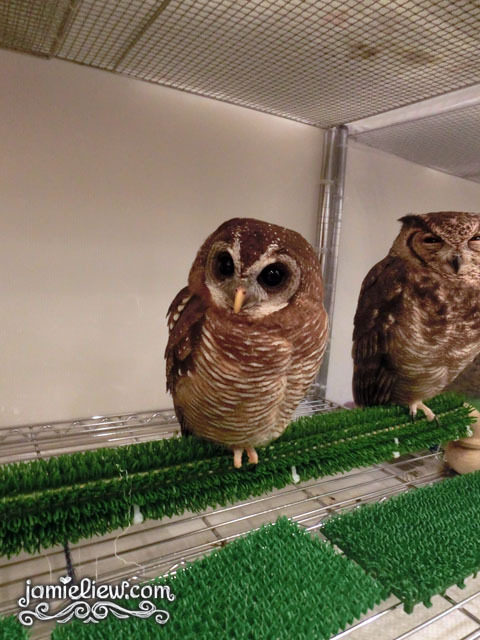 one thing I noticed about them is that.. certain owls squint a lot. like that. 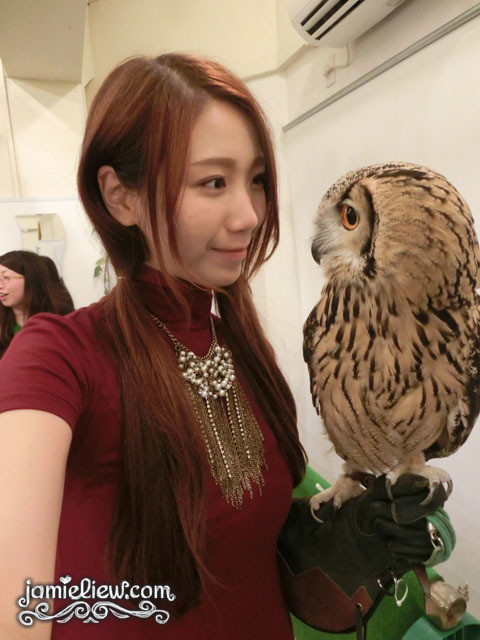 when an owl gets scared they actually say sorry to the owl and their care taker even gave the owl a big warm hug ngaww T_T. 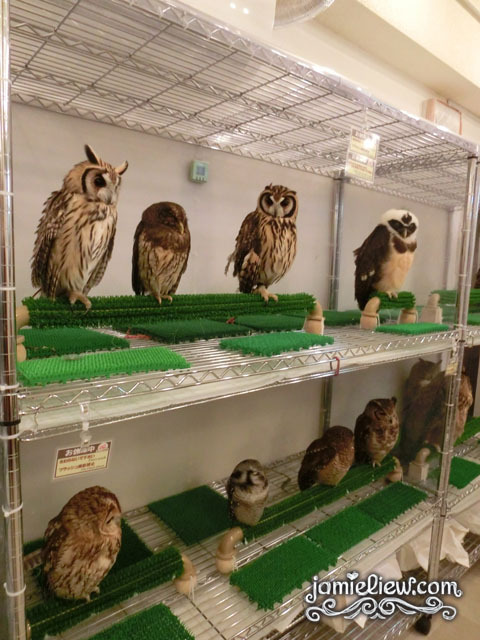 they also require everyone to sanitize their hands before touching the owls. and you can only stoke and owl’s head and back with the back of your hands =). 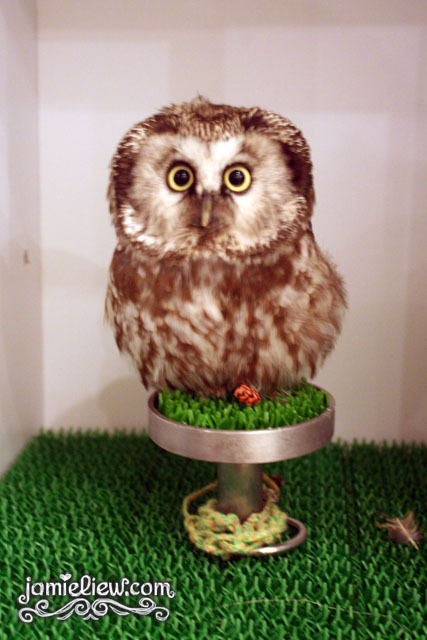 SO, my first owl. you can put it on your arms, shoulders or…….. HEAD. but the thing about putting it on your arms and head is that.. you need to bear the consequences if they suddenly poo poo on you =X. thank goodness for me, I had him on my head for quite a while but he just enjoyed grabbing my hair. does it hurt? nope, not at all =D. and at certain angles, he look so completely clueless hahaha. <3. 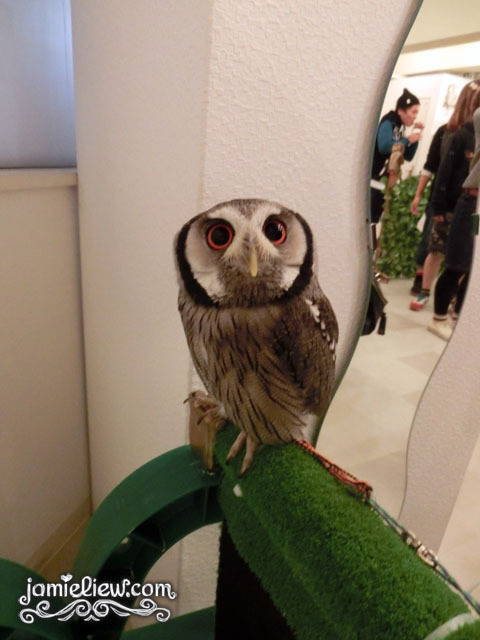 then I found an owl who liked looking at me. 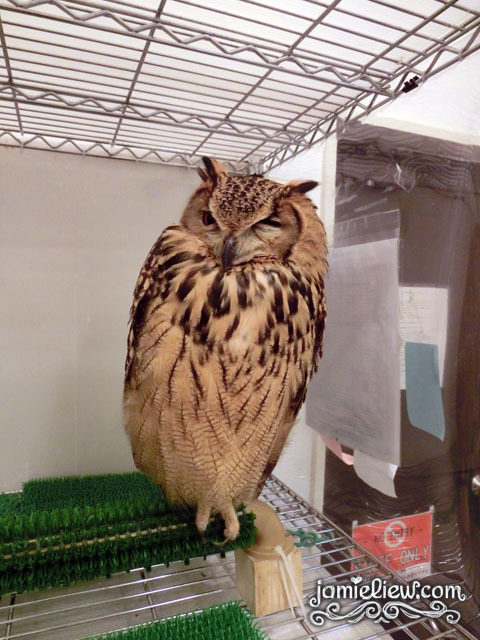 bigger owls are put on your hands and because they have… ridiculously long claws, you’d better wear a glove for it! the employees don’t though ahhaha. meet little wasabi. I wanted to put her on my head but I just saw someone else having poop on their shoulders so I thought having poop on my shoulders would be better than directly on my hair =X. 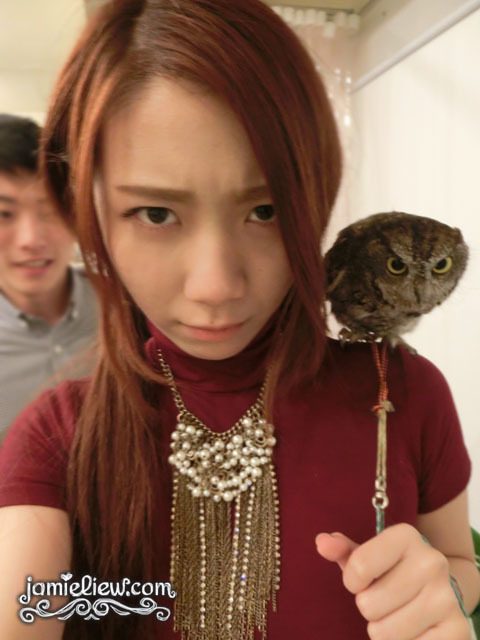 I found my owl twin!!! 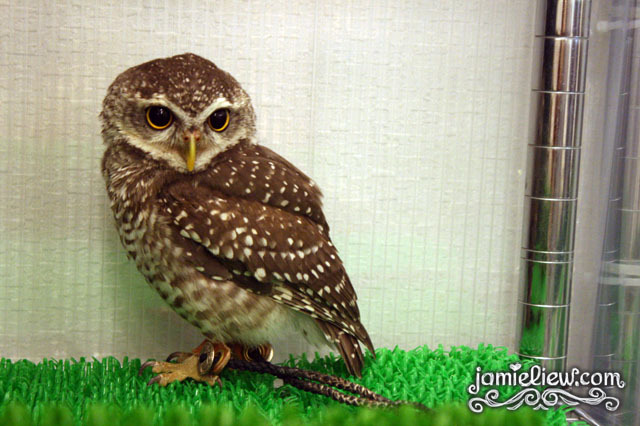 and then there’s this owl that doesn’t look like an owl. 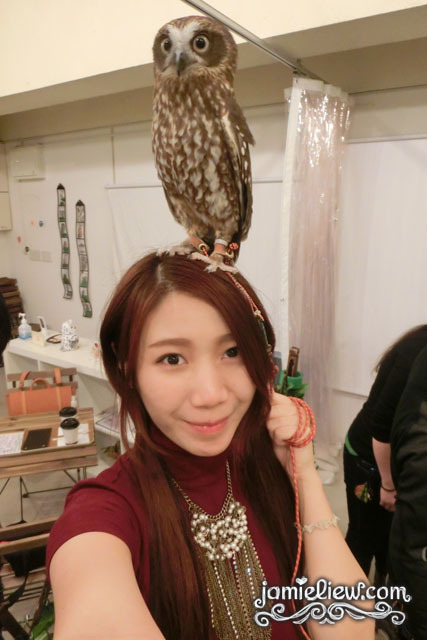 back to my cute baby owl! <3. 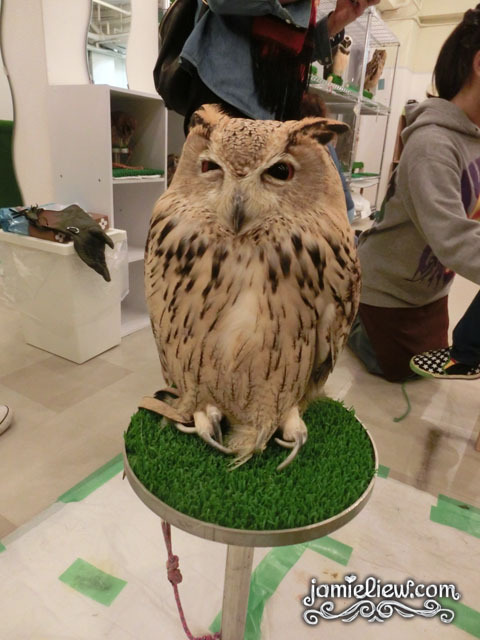 this owl was realllllly heavy. I could only hold it up for like 5 minutes and my hands got so tired =S. 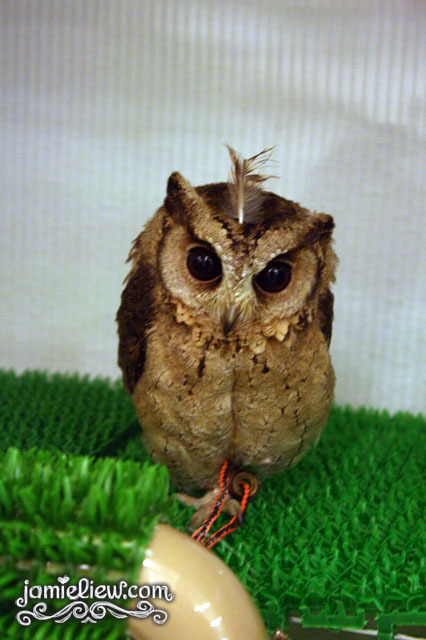 so our baby owl’s balding. just kidding. 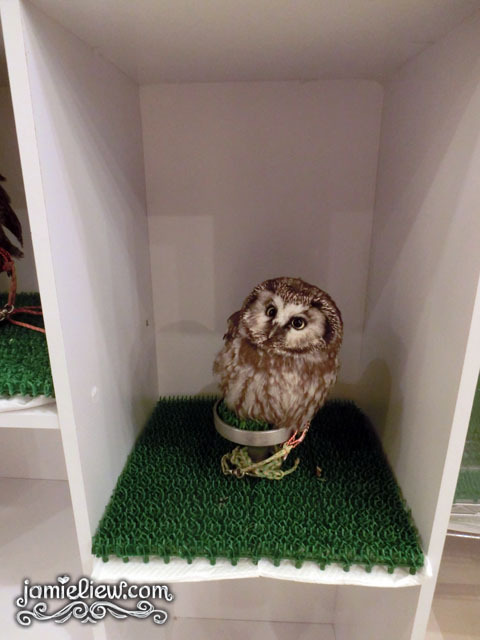 owl feathers are said to give you good luck!! they sell them for like.. 500-1500yen so if you see one GRAB IT! but make sure nobody saw you *chokes*. 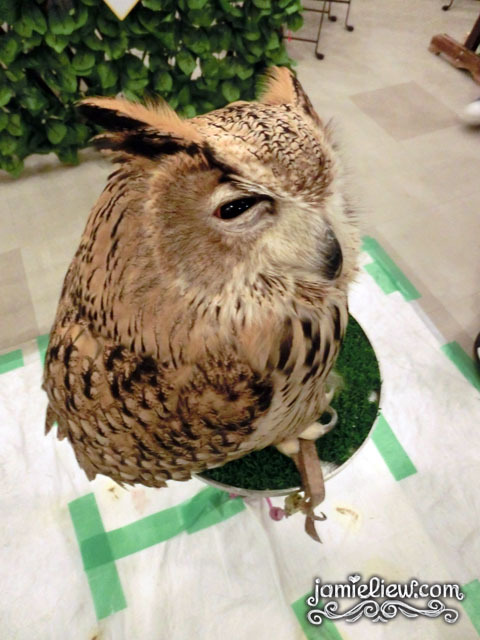 but the employee there took it’s feather and put it on the evil looking owl’s head. ahahahha. he didn’t even realize. 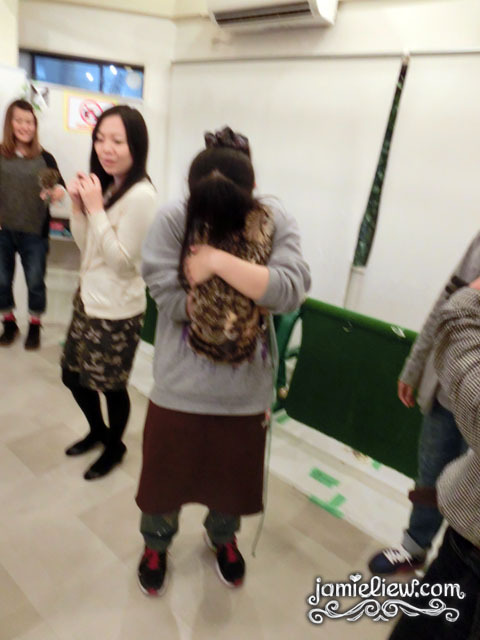 look how warm and fuzzy it looked <3. 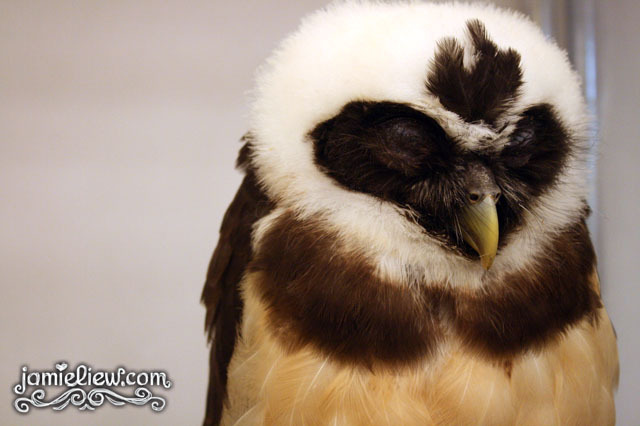 so owls here sleeps at night with their caretakers =3. Honey Butter Chips and Christmas! This is a very cute entry! Totally loves it!